Your Church Management System is the foundation for your big data strategy. Pick a solution that is focused on people. 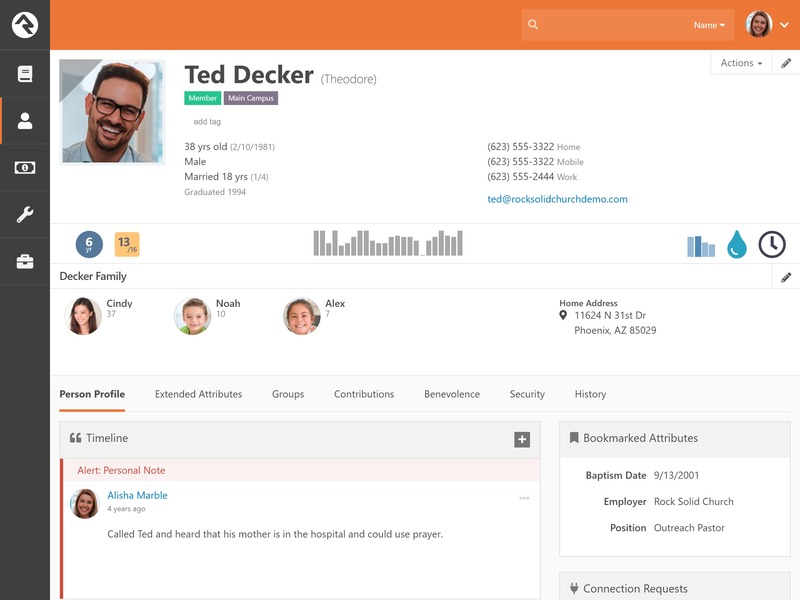 Rock is an open source church management system that focuses on the heart of ministry - people. Fully-featured and mobile-friendly, Rock is building a vibrant community and innovative new solutions to meet your ministry goals. Owned and shepherded by a non-profit ministry itself, Rock will always focus on meeting the needs of the organizations it serves. Learn more about Rock with our in depth FAQ video. 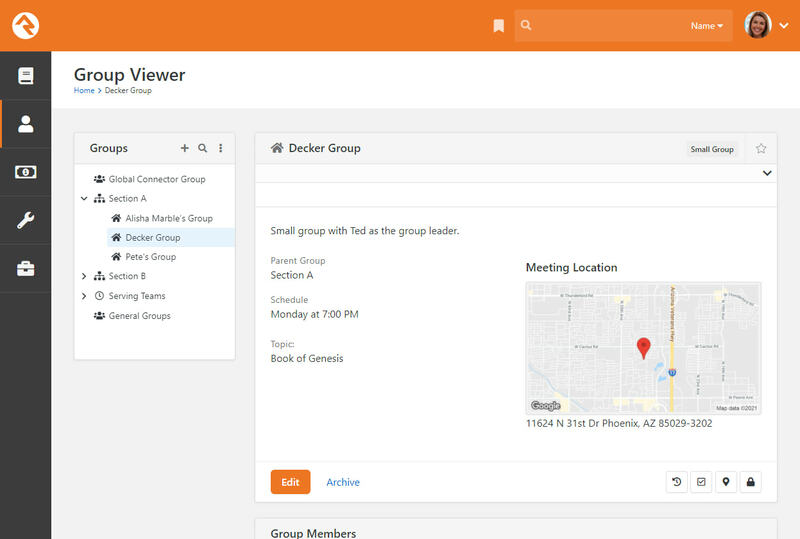 Rock is built on a full church management feature set and is focused on new ministry-empowering innovations that you won't find in any other ChMS. The core of Rock is about managing people and their relationships between each other and the church. It all starts with an individual. With Rock, you have the ability to add an infinite number of attributes to a person's record. These attributes can be easily grouped and reported. The notes you add are clearly visible and easily added and secured. You can also classify an individual's activities with simple icons we call badges. These can be simple representations of a single data item, like baptism, or they can be richer with more data density, like showing a family's last 12 months of check-ins as a simple bar chart. Groups are the fundamental building blocks of Rock. Whenever two or more individuals are linked in a relationship, you can bet groups are the glue that makes them stick (families, security roles, serving teams, Bible studies, etc.). This consistency means that each type of group has many configuration possibilities. Rock's check-in is simple and extensible. 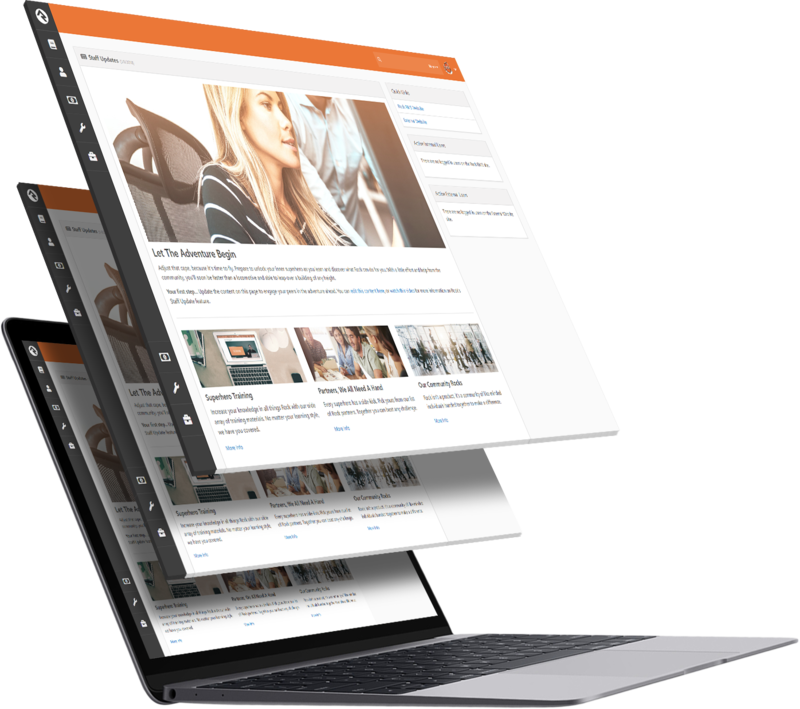 It's built on top of a powerful workflow engine so you can customize it to your heart's content. The check-in screens are also very easy to theme if you have some web design talent. Every organization has events. Rock allows you to track and publish these events to your guests. 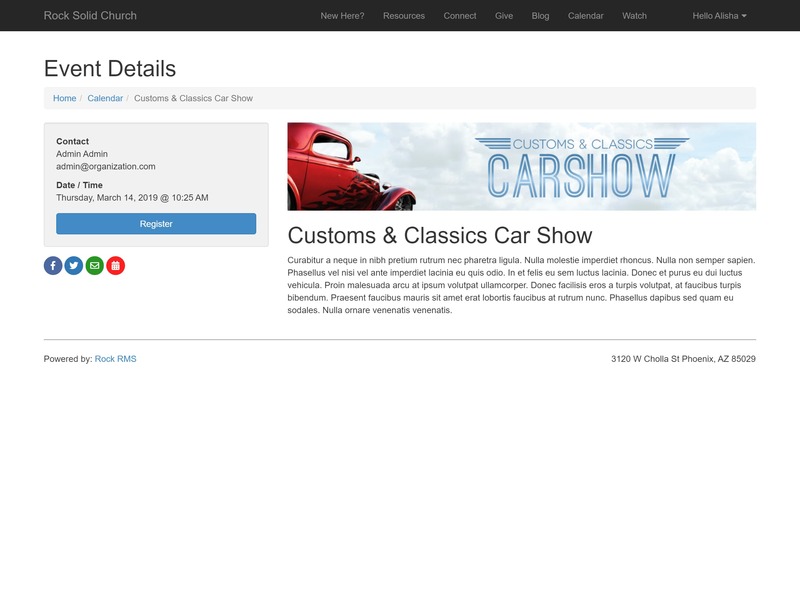 Once your guests see an event they can also register online for them. The features around the calendar and event registration are too numerous to cover here so head on over to our Event & Calendar Guide for more information on how to use these valuable features! 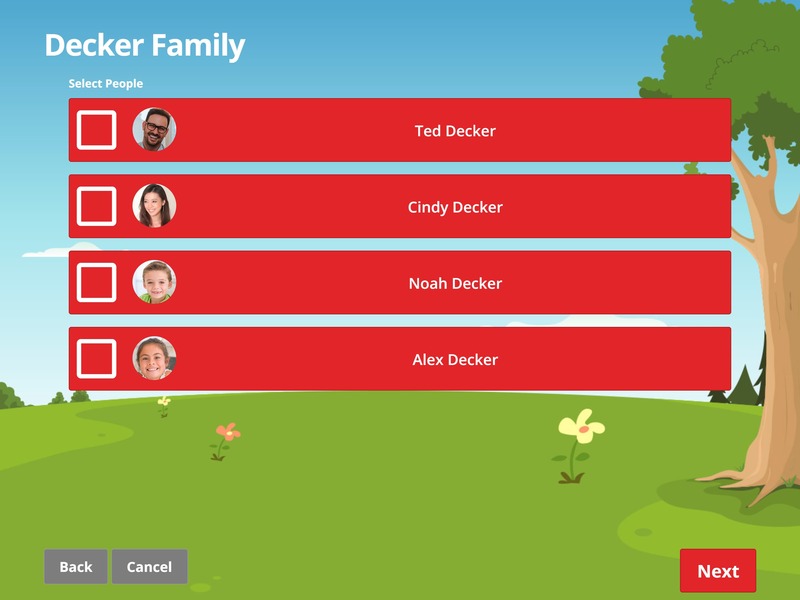 Rock's connection features help you to move your guests from visitors to fully engaged members. 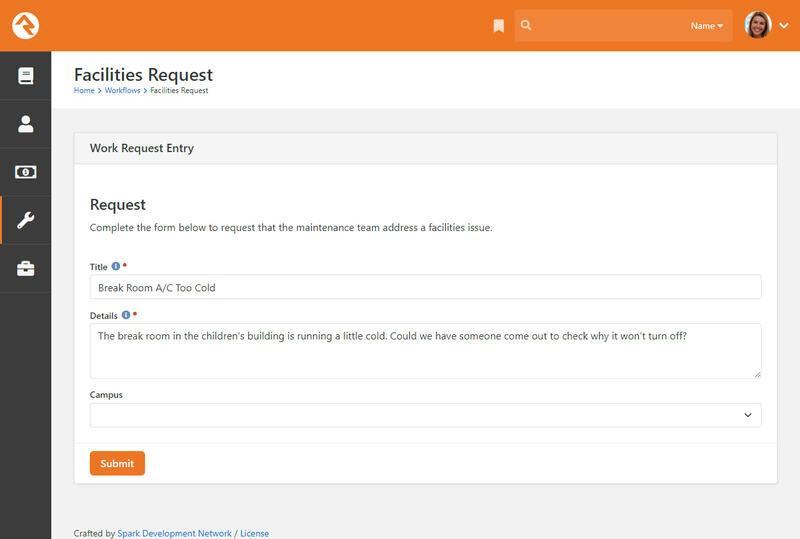 These features come configured to help manage and connect your volunteers, but you can add as many connection types as you'd like. In fact we have a whole manual ready for you to customize these features to your organization's need. Getting your data out of software is just as important as putting it in. 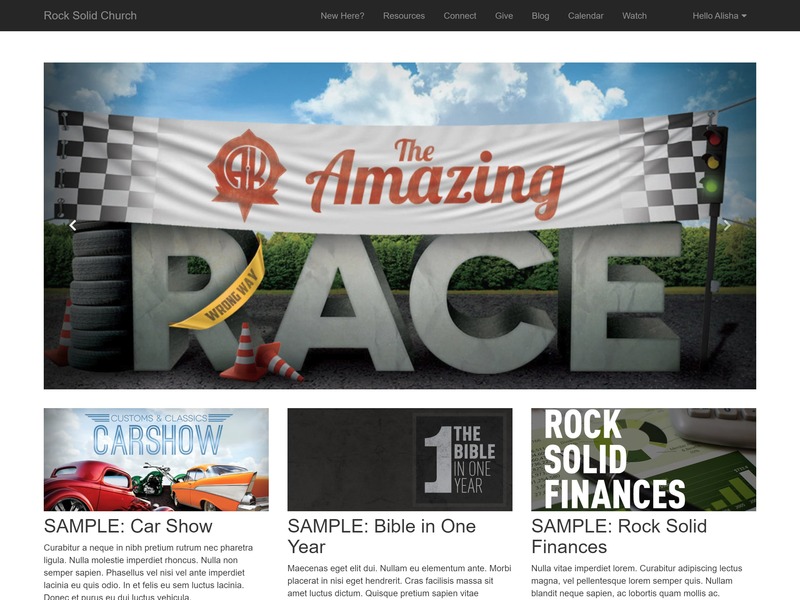 Rock has several tools to help you generate powerful reports of your ministry data. 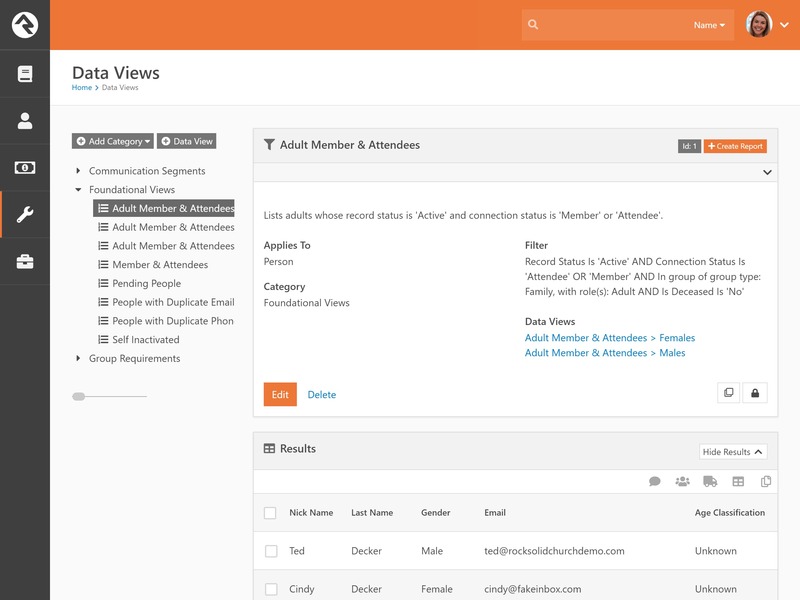 The core of our tools is a concept of Data Views. 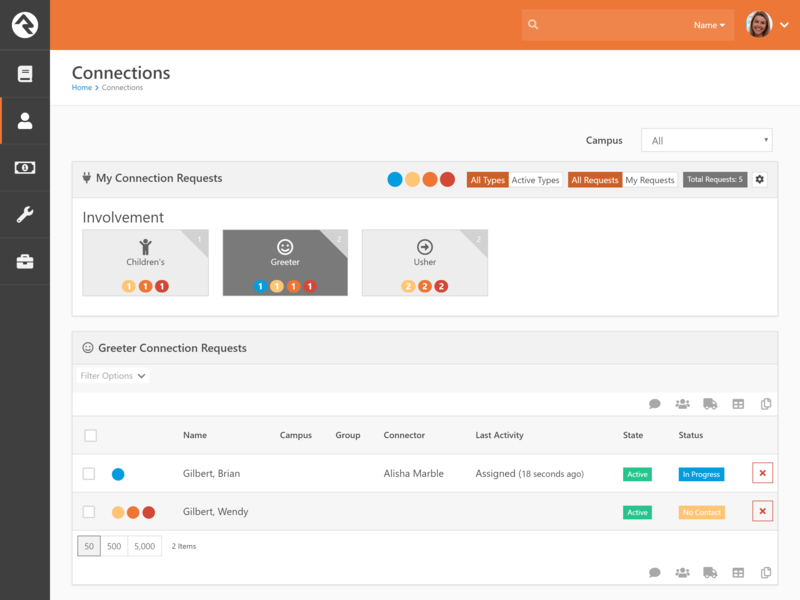 These allow you to create strong reports that build on each other. This will reduce the number of duplicate or near-duplicate reports you create. As a ministry leader, you should be focusing on people. And Rock makes it easy. Powerful workflow engines allow you to automate the details that prevent people from slipping through the cracks. 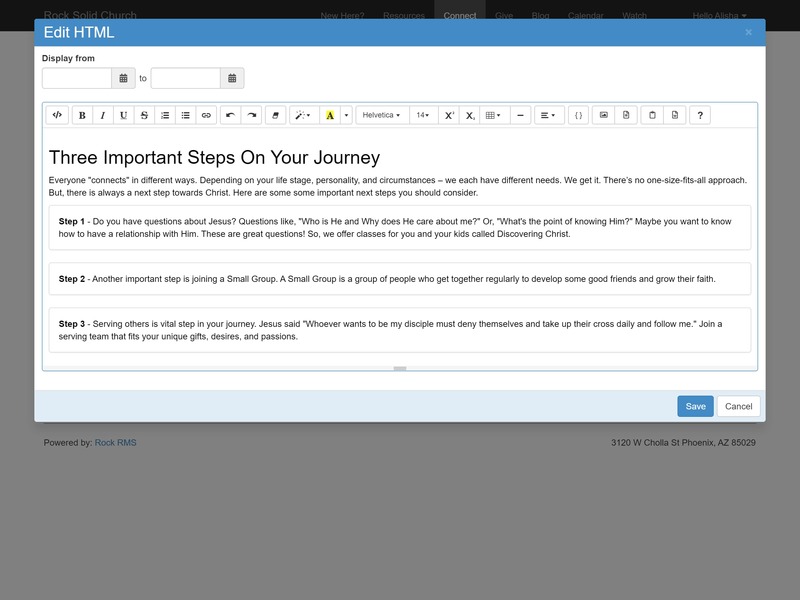 Simple or complex, Rock workflows are essential ministry support tools. Data is only as good as it is clean and visible. Use Rock's built in de-duplication tools to keep it clean, and explore the many ways to visualize the trends and stories your data represents with tools for customizable reports, dashboards and more. Harness the power of your data to personalize your web experience. Show your attendees that you know them and care about them with a deeply personalized experience and content. Your Rock-powered website is simple because Rock was built as a web-based platform from the ground up. 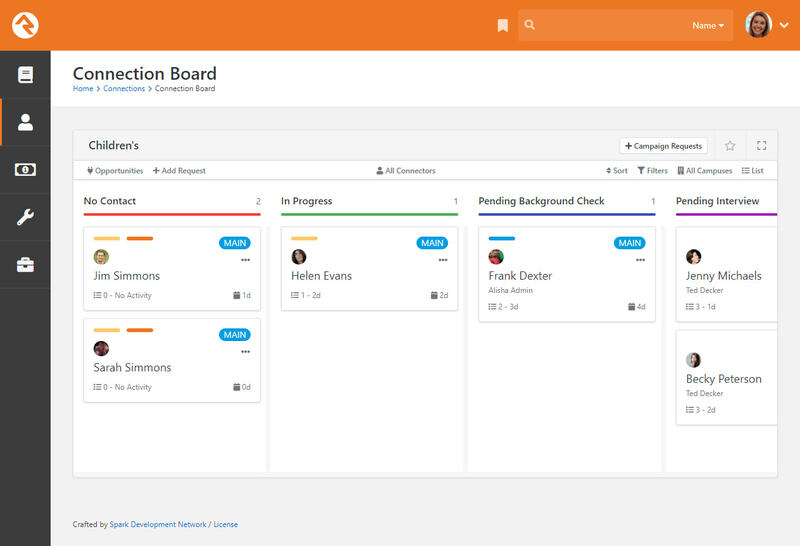 Manage your calendar from inside your database. Have as many calendars as you need, tie them to event registrations and promotions on your website for a smooth and elegant experience for your attendees. Managing your web content no longer requires tehcnical skills or web developers. Use Rock's built-in content management for your events and communications staff to tweak their messaging to their hearts' content. Simplify your giving experience and management with Rock's built-in giving tools. Or, if you prefer, select from a number of integrated payment processing systems and gateways to process online giving from many sources. 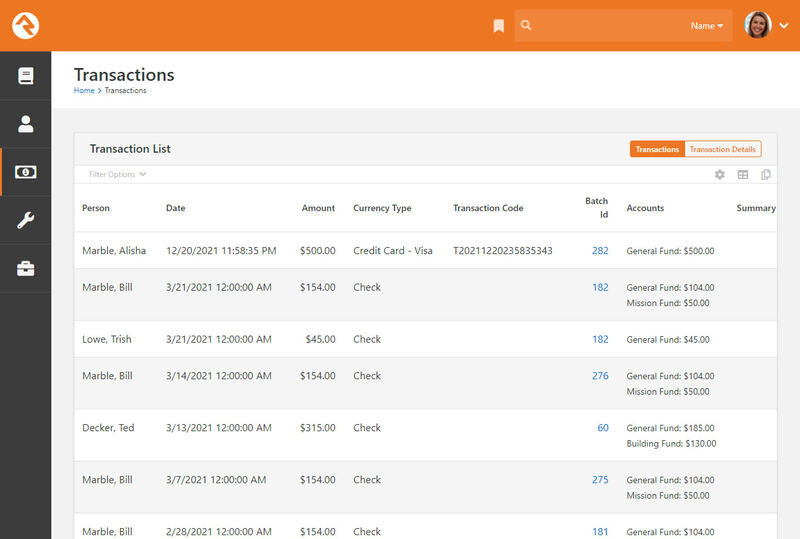 View transactions on each donor's personal profile or in aggregate with our giving features. Match your funds and batches to your accounting software and you're all set. Use our contribution statement generator to create year-end statements for all donors. 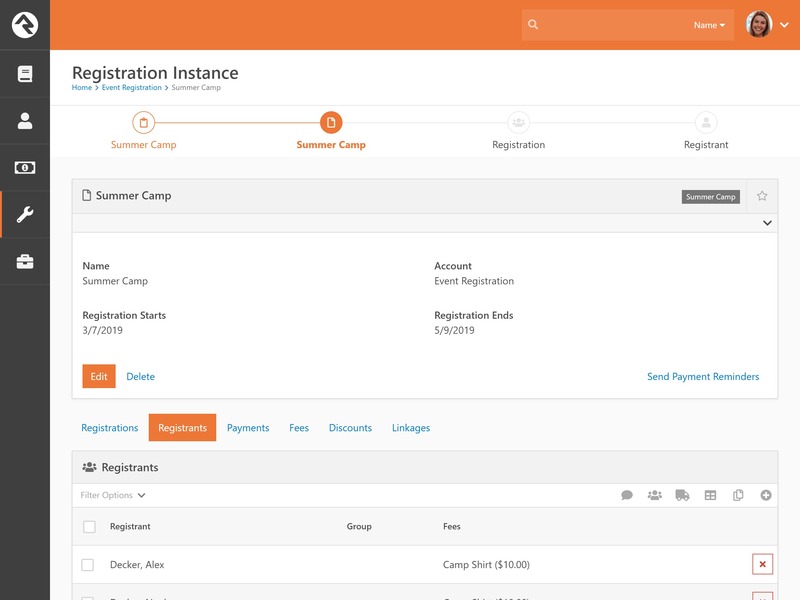 Process payments for paid events within your online event registration with Rock's giving tools. Take deposits, apply discounts and send payment reminders with a simple button click. Keep the registration and the administration processes simple. View your contributions and pledges with configurable real-time analytics reports. 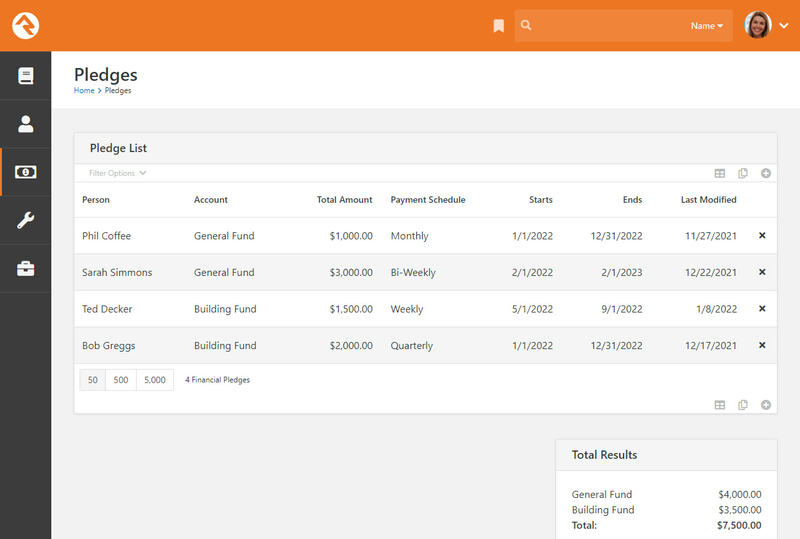 Choose to dive deep into one-time or scheduled transactions, batches, pledges, benevolence, fundraising and more with our built-in tools, or add your own financial reports. Create campaign-centered or annual pledges and track your progress by individual donor or by fund. See the whole picture with Rock's pledge tools. Customizing Rock is as easy as a one-click plug-in install through the built-in app store. 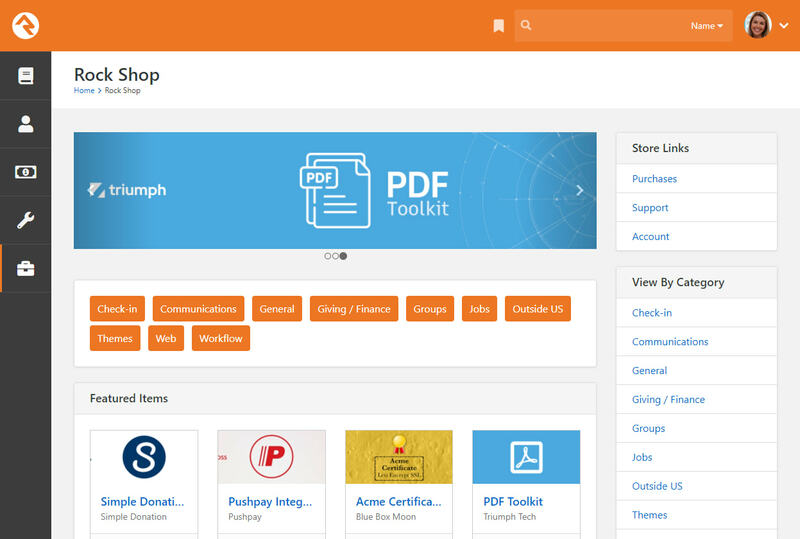 Find solutions and tools from churches, vendors and the core team by scanning the Rock Shop. Each app has documentation and support links, and most likely a few fans in the community who can give you a rundown of each one's benefits. 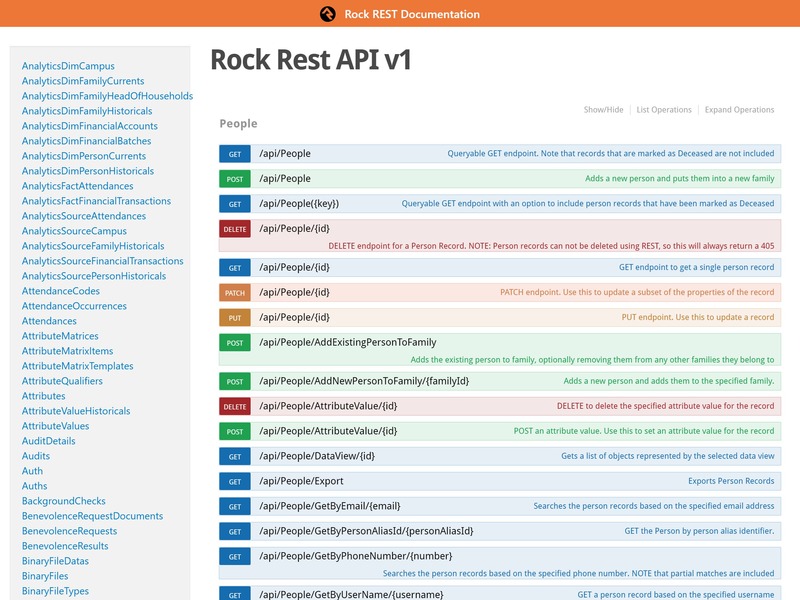 Rock has an open API. That means it can be extended almost infinitely with the right skillset. 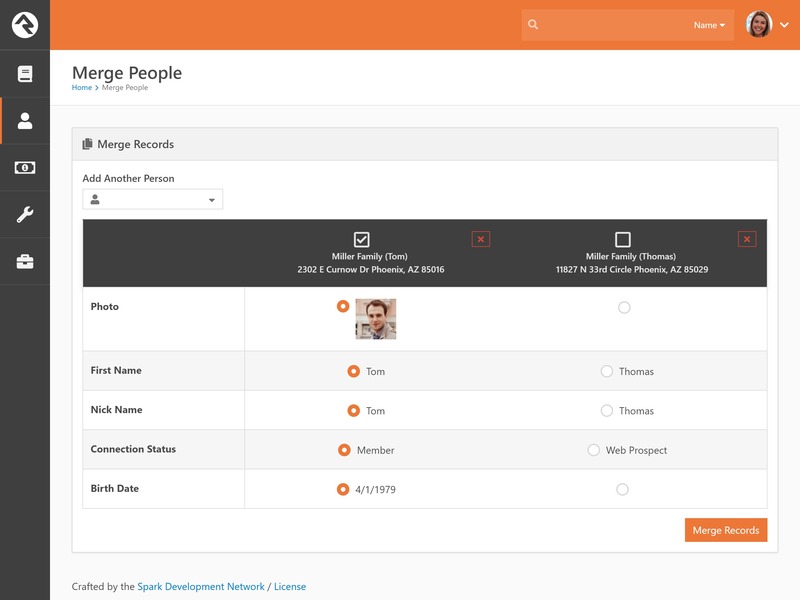 If your staff doesn't include developers, you'll be able to find a Rock Partner with the experience and insights to build your solution for you. We like to say that Rock is like a kit of Legos and you can configure and extend it for maximum flexibility. Don't worry if APIs and technical extension projects sounds like Greek to you, Rock is fully functional right out of the box, so there is no need to dig in here unless you really want to. Rock Chat is a constantly active and central spot to connect with our growing community. From best practices to support, the real life experts are just a click away. Searchable and easy to use, the Rock Q&A site archives the questions and answers of those who have gone before. You may start by asking questions here, but we bet you'll be answering them soon. Rock isn't static - we listen to community needs and release new updates constantly. Add your best ideas here, and use your monthly allotted upvotes wisely to bring the next feature set to life.